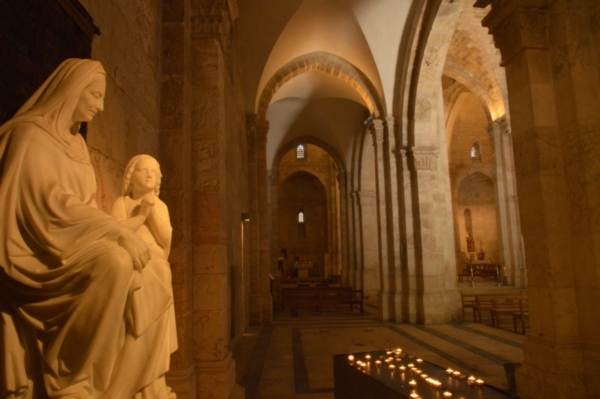 Church of the Nativity:The Church of the Nativity, an official UNESCO World Heritage Site, is located in the center of Bethlehem, built over the cave that marks the birthplace of Jesus Christ. The church is not managed by a specific Christian denomination but is shared by several, namely: Roman Catholic, Greek Orthodox, and Armenian Apostolic Orders, as well as Syriacs and Copts. Shepherd’s Field is an area southeast of Bethlehem that has a chapel marking the location where the Angels announced the birth of Jesus Christ to the shepherds who were guarding their flock. The Chapel is managed by and under the protection of the Franciscan order of the Catholic Church. A second chapel, managed by the Greek Orthodox, commemorates the same events nearby. 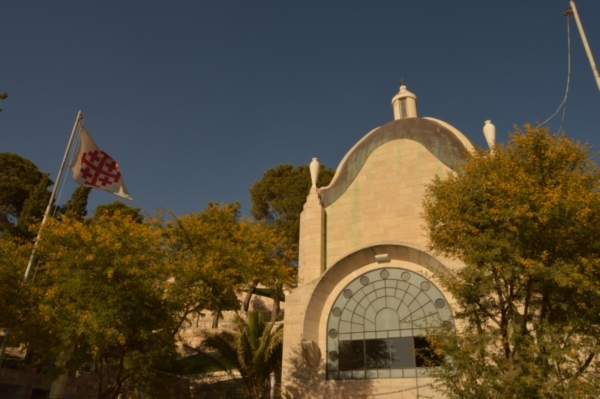 The Milk Grotto is a Roman Catholic chapel located near the Church of the Nativity. It commemorates the time when the Holy Family took refuge before fleeing to Egypt during King Herod’s order to slaughter the innocent. According to tradition, a drop of milk fell from the Virgin Mary on the floor of the cave, turning its color to white. The Mount of Temptation is located in the Judean Desert in the city of Jericho, where Jesus was tempted by the devil for the third and final time to jump in front of “all the kingdoms of the world” (Matthew 4:8). 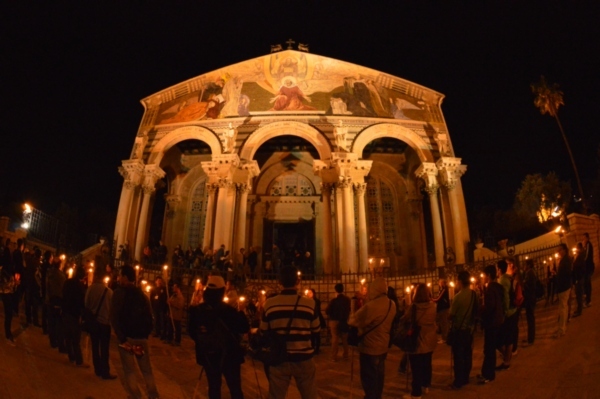 A Greek Orthodox Church, positioned halfway up the mountain, commemorates the event. Basilica of the Annunciation:The basilica of the Annunciation is one of the largest of its kind in the entire Middle East. It is located in the heart of Nazareth, just above Spring Square (Market Plaza). 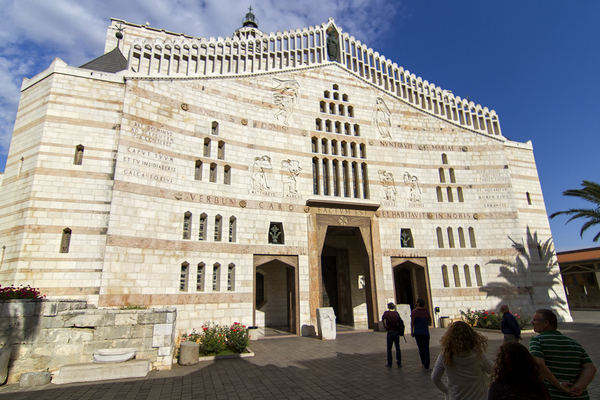 Built over what is considered to be the house of the Virgin Mary, the basilica commemorates the “Annunciation” made by the Angel Gabriel to the Virgin Mary, telling her she would conceive the Son of God, Jesus. It is currently under the control of the Franciscan order in the Catholic Church. 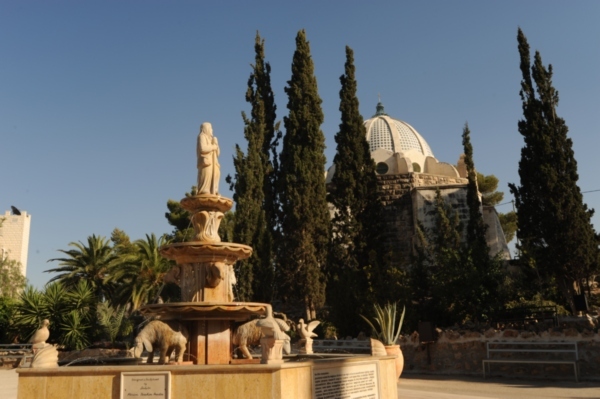 Cana of Galilee:Cana is located north-east of Nazareth. There are 2 churches - one Catholic and one Greek Orthodox - that commemorate the Jesus Christ’s first miracle of turning water into wine during a wedding. 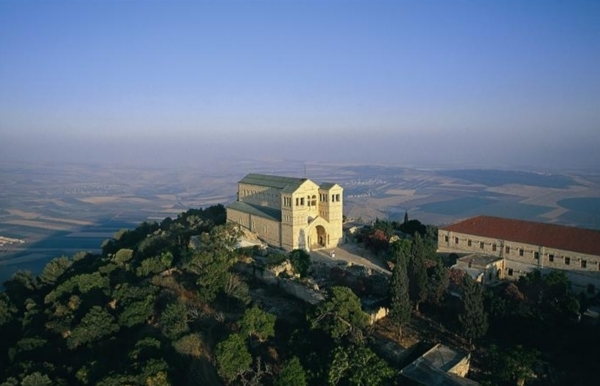 Mount Tabor:Mount Tabor is traditionally known as the place of the transfiguration of Jesus – his becoming radiant and full of glory in his spiritual state. According to the Gospel, the event took place on a “high mountain” with Jesus and 3 of his disciples. The church atop of the mountain is owned and managed by the Franciscan order of the Catholic Church. Capernaum:Capernaum, located just north of the Sea of Galilee, was inhabited from the 2nd century BCE until the 11th century CE. The village was the home of Saint Peter and is believed to be where Jesus frequently stayed. The Franciscan order built a beautiful octagonal built chapel over the house to commemorate it. The Monastery of the 12 Apostles is a Monastery about 145 meters east of Capernaum and is dedicated to the 12 Apostles. Owned by the Greek Orthodox order, it marks the place where Jesus lived during most of his Galilean ministry. Tabgha: Tabgha is located on the northern shore of the Sea of Galilee. The church built there commemorates the miracle of the multiplication of the loaves and fish performed by Jesus. Inside the church is a beautiful mosaic floor that displays the occasion. The Catholic order of Saint Benedict currently maintains the site. 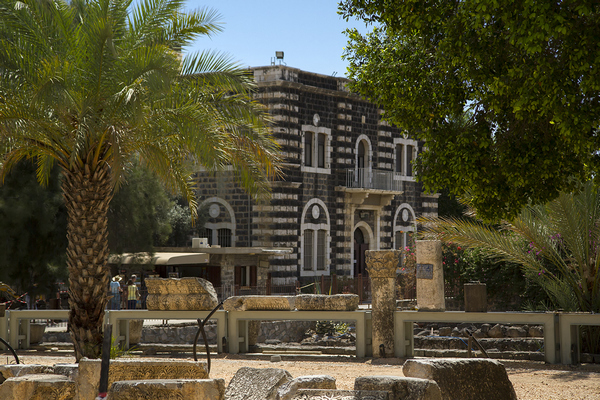 The Church of the Primacy of Saint Peter is also located in Tabgha, just a few dozen meters away from the Church of the Multiplication. The church, maintained by the Franciscans, commemorates the preeminence attributed to Saint Peter among the 12 Apostles. It is also believed to be the place where Jesus appeared for the 4th time after his crucifixion. 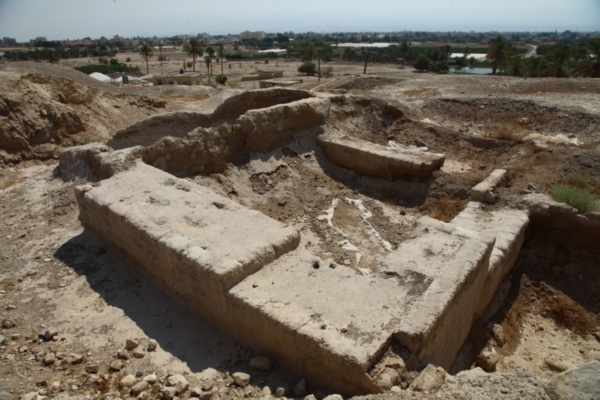 Qasr El Yahud: Located on the Jordan River East of Jericho, Qasr El Yahud is traditionally the site where John the Baptist baptized Jesus Christ and where the gates of heaven opened and the Holy Spirit descended on to Jesus – visited by Catholics and Greek Orthodox. The site is l administered by the Israeli Ministry of Tourism as an Israeli National Park. 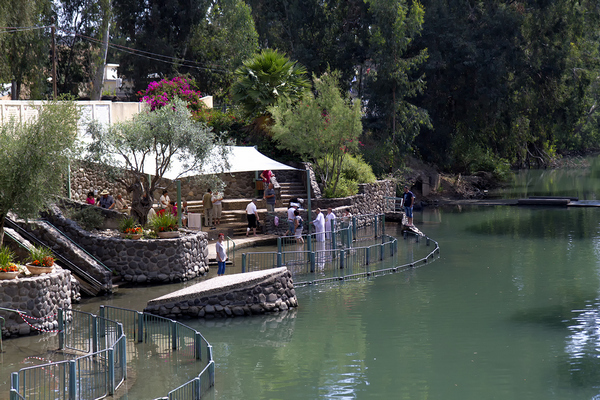 Yardenit Baptismal Site: Also located on the Jordan River southwards of the Sea of Galilee, the Yardenit Baptismal Site commemorates the Baptism of Jesus for the Protestant denominations. Caesarea Philippi: Caesarea Philippi was once an ancient Roman city south of Mount Hermon. According to the Gospels of Matthew and Mark, it is here that Saint Peter recognized Jesus as the Messiah. It is also mentioned that Jesus passed through the city but without ever entering it. 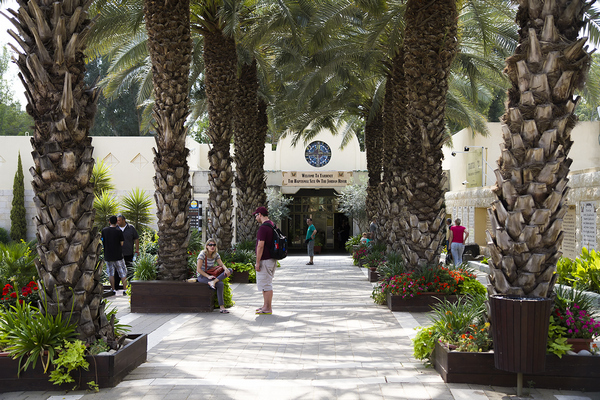 The Dominus Flevit Church is located on the ascent of the Mount of Olives. It’s name means “The Lord Wept” in Latin, referring to the tears of Jesus when he foresaw the destruction of Jerusalem. The Church’s roof is shaped like a teardrop to commemorate this event. Today, it is held in trust by the Franciscan order and Custody of the Holy Land. 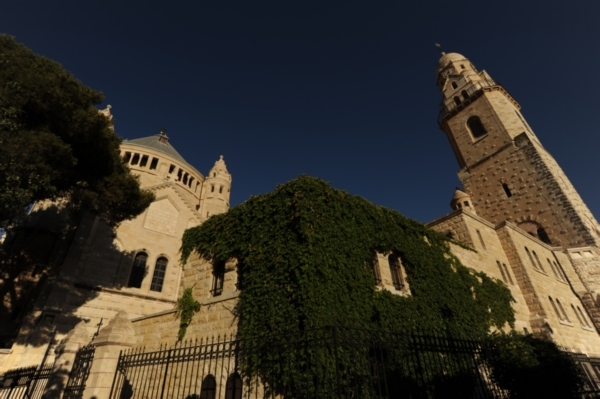 The Church of Pater Noster is a Roman Catholic Church, part of a French Carmelite monastery,located on the Mount of Olives. 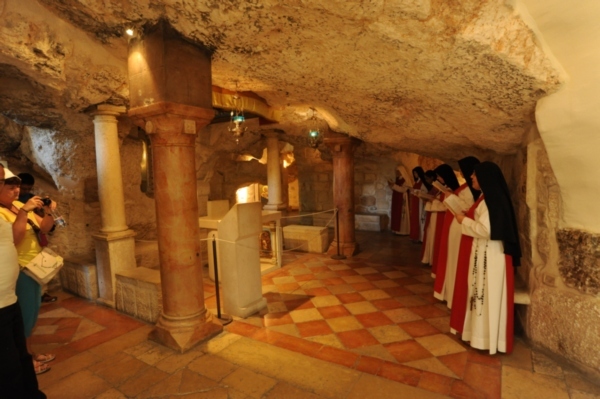 Pater Noster, meaning “Our Father” is derived from the Lord Jesus Christ giving his teachings in cave under the Church. Chapel of the Ascension: Located just a few meters away from the Church of Pater Noster, the Chapel of the Ascension commemorates the ascension of Jesus to Heaven – for both Catholics and Greek Orthodox. Nearby, is the Russian Chapel of Ascension – for Russian Orthodox pilgrims. 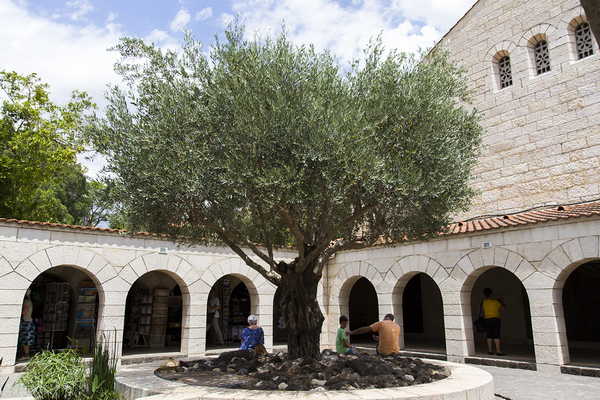 Church of All Nations - Garden of Gethsemane: This beautiful church is located on the foothills of Mount of Olives. The Church of All Nations has 12 domes, representing the 12 nations that participated in erecting the church in 1919. Gethsemane is the name of the garden outside of the church and is famous as the place where Jesus prayed on a rock (known as Rock of Agony) before the night of his crucifixion. The site is mainly visited by Roman Catholics and held trust by the Franciscan Order. 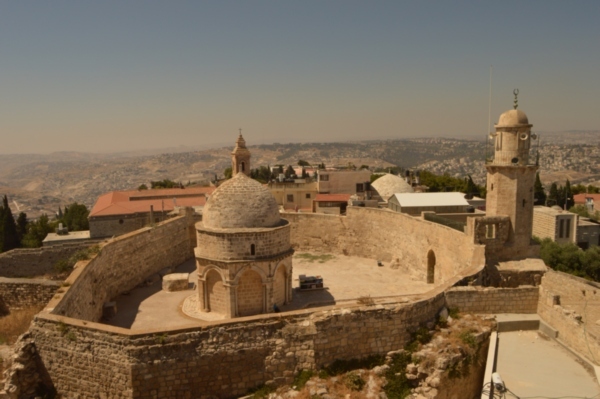 Church of Saint Peter in Gallicantu: The Church of Saint Peter in Gallicantu stands on the Eastern slope of Mount Zion, just outside of the Old City’s southern wall. It commemorates the triple denial of Jesus by the Apostle Peter, his regret in committing such action, and his reconciliation with Jesus after his resurrection. Under the church is a dungeon, believed to be the cell where Jesus was detained the night before his arrest. The church is administered by the Catholic Church. 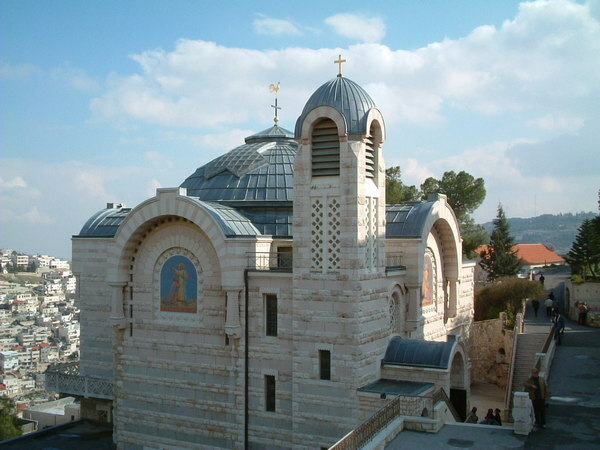 The Abbey of the Dormition: The Dormition Abbey is a Monastery of the Benedictine order. 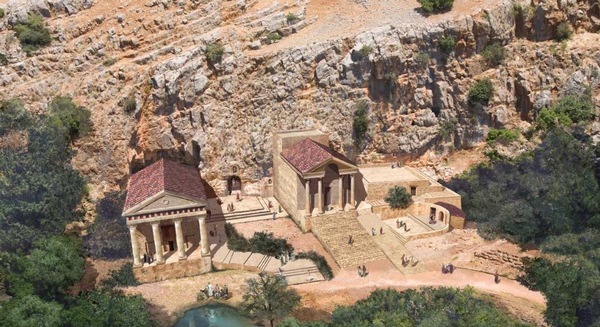 It is also located on Mount Zion, near the Church of Saint Peter in Gallicantu. In tradition, the lower floor of the monastery was the spot where the Virgin Mary slept and was taken, body and soul, to heaven. 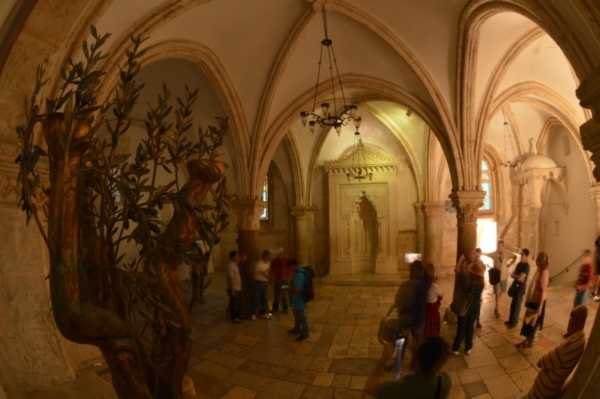 The Cenacle – Last Supper Room: Also located on Mount Zion, close to the Abbey of Dormition, The Cenacle commemorates Jesus’ final meal with his Apostles before his crucifixion. Other events, such as the washing of his disciples’ feet and the descent of the Holy Ghost Upon the disciples on the day of the Pentecost, are attributed to the Cenacle. Church of the Flagellation: The Church of the Flagellation is situated in a small compound of the Old City of Jerusalem, near Lion’s Gate. 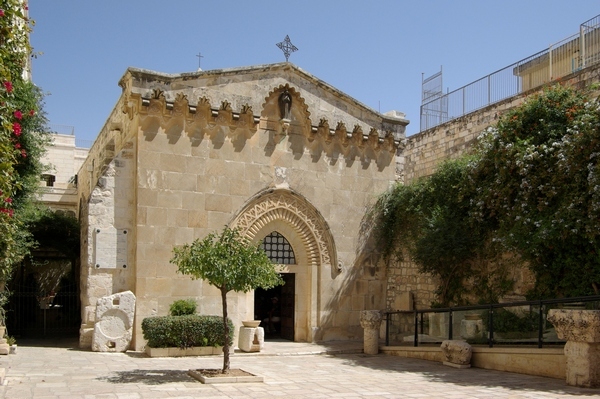 The area also encompasses the Church of the Condemnation and imposition of the cross, marking the spot where Jesus was flogged by Roman soldiers before he carried the cross down the Via Dolorosa. The complex is managed by the Franciscan order. 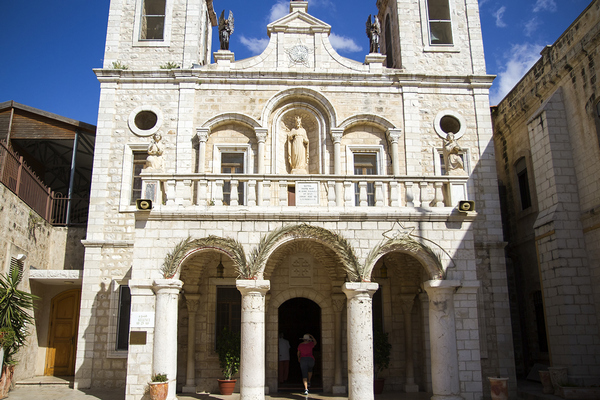 Saint Anne’s Church: Situated at the start of the Via Dolorosa near the Lion’s Gate, Saint Anne’s Church is built on what is believed to be the childhood home of the Virgin Mary, along with her parents, Joachim and Anna. The small grotto is in the lower part of the church. Next to it, according to the Gospel of John, is the Pool of Bethesda, which was used for healing. 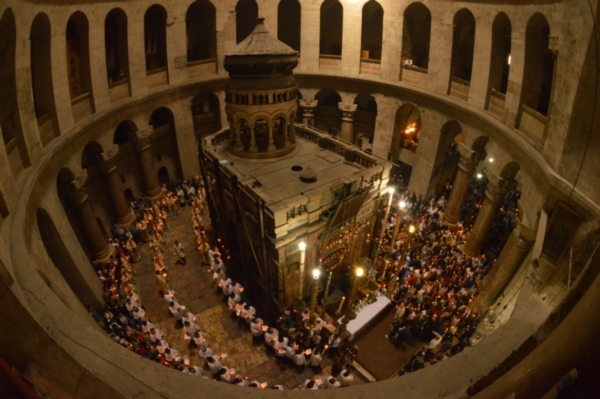 The Church of the Holy Sepulcher: Since the 4th century AD, the Church of the Holy Sepulcher is known to be the holiest place in Christianity. 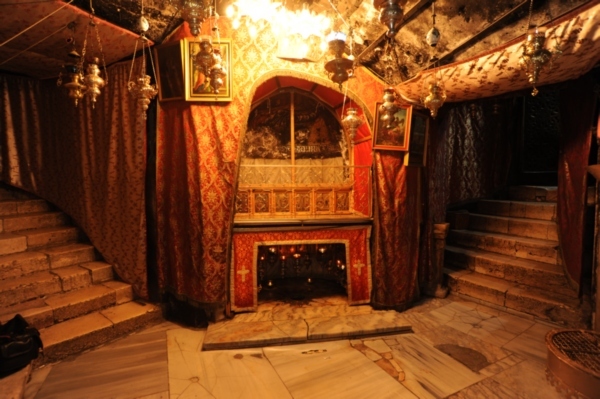 It contains the sites where Jesus was crucified at the “Calvary”, and his tomb where he was buried and resurrected. The last 4 stations of the Via Dolorosa, representing the last moments of Jesus before His death are within the church. 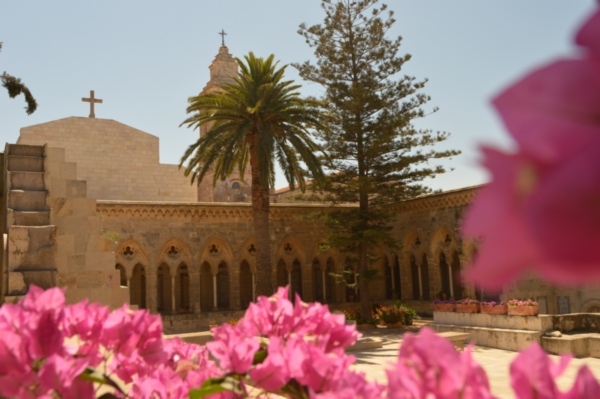 Most of the property is managed by the Greek Orthodox and the Roman Catholic denominations, however, there are a few areas inside run by Coptic, Armenian, Syriac, and Ethiopian denominations.